Charles-Louis de Secondat, Baron de La Brède et de Montesquieu (January 18, 1689 – February 10, 1755), more commonly known as Montesquieu, was a French political thinker and jurist, who lived during the Enlightenment and made significant contributions to modern political sociology and the philosophy of history. His Lettres Persanes (“Persian Letters”), published in 1721 just after the end of the reign of Louis XIV, was a satirical portrayal of Parisian civilization as seen through the eyes of two Persian travelers. Considerations sur les causes de la grandeur des Romains et de leur decadence (“Reflections on the Causes of the Grandeur and Declension of the Romans,” 1734) and De l’esprit des loix (“The Spirit of the Laws,” 1748) are among the greatest works in the history of political philosophy and established Montesquieu as a philosopher of the Enlightenment. Montesquieu defined three forms of government: republics, monarchies and despotisms, each with a unique structure and each characterized by its own principle. Republics are characterized by the virtues of patriotism and egalitarian fraternity, monarchies by honor and despotisms by fear. He suggested that forms of government are partially determined by physical factors, especially by climate, but that wise legislators, once they understood the laws governing the social world, could compensate for physical disadvantages by the use of intellectual and moral force. Montesquieu is famous for articulating the theory of separation of governmental powers into legislative, executive, and judicial. This concept is a basic assumption in modern discussions of government and has been implemented in many constitutions all over the world. His promotion of the division of powers, which he saw in the English constitution, influenced the Founding Fathers of the United States when they were deliberating over the Constitution of the United States. Montesquieu is also known for popularizing the terms "feudalism" and "Byzantine Empire." Charles-Louis de Secondat was born on January 18, 1689 at La Brede, near Bordeaux, France, the eldest son of a noble and prosperous family. His father, Jacques de Secondat, belonged to a modestly wealthy military family that had been honored during the sixteenth century for service to the crown. His mother, Marie-Francoise de Pesnael, was partially of English ancestry and brought the valuable wine-producing property of La Brede to the family. She died in 1696, passing the barony of La Brède to Charles-Louis, then aged seven. Charles-Louis was educated at home and in the village, and then sent away in 1700 to the Collège de Juilly, in the diocese of Meaux close to Paris, where the priests of the oratory provided a sound modern ("enlightened") education. In 1705 he went to the University of Bordeaux to study law, became an advocate in 1708 and moved to Paris. In 1713 he was called back to Bordeaux by the death of his father, and in 1715 he married Jeanne de Lartigue, a wealthy Protestant, and they had two daughters and a son. Charles-Louis admired his wife’s business ability and left her in charge of the property during his absences. In 1716, his uncle Jean-Baptiste, baron de Montesquieu, died and left him his estates, the barony of Montesquieu, and the office of deputy president in the Parlement of Bordeaux. Socially and financially secure at the age of 27, Montesquieu devoted his time to his judicial duties (for which he made a careful study of Roman law), the administration of his property, and the study of the sciences at the newly-formed academy of Bordeaux. In 1721 he published anonymously Lettres persanes (“Persian Letters,” 1722), satirizing French culture and Parisian society as seen through the eyes of two Persian travelers. The book mocked the reign of Louis XIV, which had recently ended; made fun of the various social classes, discussed the theories of Thomas Hobbes in an allegorical story of the Trogolodytes; continually compared Christianity and Islam; analyzed the papal bull Unigenitus which had been directed against the Jansenists; and satirized Roman Catholic doctrine. The authorship of Lettres persanes was soon discovered and Montesquieu became famous. The work met with an unfriendly reception from supporters of the regime in France and from the Catholic Church, which banned his works in 1751 and added it to the Index Librorum Prohibitorum (list of books prohibited by the Roman Catholic Church). The rest of French intellectual society found this expression of new ideas stimulating, and the book was highly praised in England. Montesquieu went to Paris in 1722, and was introduced into court society by the duke of Berwick, an exiled Stuart prince whom he had met in Bordeaux. He became involved in the dissipations of French court life. During this period he met the English politician Viscount Bolingbroke, who influenced his later analysis of the English constitution. In 1726 he sold his office in the Parlement of Bordeaux, to raise money and establish himself as a resident of Paris so that he could apply for membership in the Academie Francaise, to which he was elected in 1728. Four months later, Montesquieu departed for Vienna, determined to complete his education by foreign travel. He visited Austria, Hungary, Italy, Germany, and Holland, arriving in England at the end of 1729. He remained there until the spring of 1731, and was presented at court, joined the Freemasons, became friends with the dukes of Richmond and Montagu, purchased books for his library, was elected a fellow of the Royal Society, and attended parliamentary debates. On his return to France, Montesquieu retired to his estate and devoted himself to writing. A controversial treatise, La Monarchie universelle was printed in 1734 but immediately withdrawn, so that only one copy remains extant. He worked on a study of the English constitution, which was not published until 1748, and on Considérations sur les causes de la grandeur des Romains et de leur décadence (“Reflections on the Causes of the Grandeur and Declension of the Romans,” 1734). After a short rest, and in spite of failing eyesight, he undertook a major work on law and politics, which required extensive reading on law, history, economics, geography, and political theory. He employed as many as six secretaries simultaneously to assist with the reading, and took volumes of notes. Publicly he was regarded as brilliant, rapid and superficial; only his closest friends knew the extent to which he applied himself. He continued to visit Paris and participate in social life, but he worked steadily on his manuscript. By 1740 the main body of the work was established, and in 1743 he began the first of two thorough revisions. In November 1748 the work was published under the title De l'esprit des loix, ou du rapport que les loix doivent avoir avec la constitution de chaque gouvernement, les moeurs, le climat, la religion, le commerce, etc (“The Spirit of Laws,” 1750). It consisted of 31 books in two volumes, a total of 1,086 pages. It is one of the great works in the history of political theory and law. Montesquieu reviewed all the previous schools of thought without advocating any of them. After its publication, Montesquieu received praise and congratulations from intellectuals all over Europe and was accepted as one of the philosophers of the [[Age of Enlightenment|Enlightenment. However, The Spirit of Laws was controversial in the eyes of the Roman Catholic Church, and Montesquieu was attacked by the general assembly of the French clergy and by the Sorbonne. In 1750 he published Défense de L'Esprit des lois (1750), the most brilliantly written of all his works. In 1751, despite the intervention of several liberal ecclesiastics and the pope’s favorable attitude, L'Esprit des lois was placed on the Index Librorum Prohibitorum. Montesquieu was completely blind by the time he died from a high fever in 1755. He was buried in L'église Saint-Sulpice in Paris, France. Montesquieu wrote The Spirit of the Laws as an explanation of human laws and social institutions. He believed that laws and social systems must be understood as a whole, and in the context of a variety of factors which affect them. Understanding the reason for the laws we have was important in itself, but also served the practical purpose of discouraging misguided attempts at reform. Montesquieu was not a utopian, either by temperament or conviction. He believed that a stable, non-despotic government that left its law-abiding citizens more or less free to live their lives should not be tampered with. An understanding of our laws would clarify the aspects which were in need of reform, and how these reforms might be accomplished. Montesquieu believed that the laws of many countries could be made be more liberal and humane, and that they could be applied less arbitrarily and with less scope for the unpredictable and oppressive use of state power. Reforms such as the abolition of religious persecution and slavery, and the encouragement of commerce would generally strengthen monarchical governments by enhancing the freedom and dignity of citizens. Lawmakers who understood the relations between laws, and physical conditions and the principles of government in their countries would be able to carry out such reforms without undermining the governments they sought to improve. Montesquieu identified three types of governments: republican governments, which can take either democratic or aristocratic forms; monarchies; and despotisms. Each form of government has a principle, a set of "human passions which set it in motion" (SL 3.1); and each can be corrupted if its principle is undermined or destroyed. In a democracy, the people are sovereign and must have the power of choosing their ministers and senators for themselves. The principle of democracy is political virtue, by which Montesquieu means "the love of the laws and of our country," including its democratic constitution. In an aristocracy, one part of the people governs the rest, and the principle is moderation, which leads those who govern to restrain themselves. In a monarchy, one person governs "by fixed and established laws," the principle of monarchical government is honor. In despotic states "a single person directs everything by his own will and caprice," and the principle of despotism is fear. According to Montesquieu, political liberty is "a tranquility of mind arising from the opinion each person has of his safety," and involves living under laws that protect us from harm while leaving us free to do as much as possible, and that enable us to feel the greatest possible confidence that if we obey those laws, the power of the state will not be directed against us. If it is to provide its citizens with the greatest possible liberty, the executive, legislative, and judicial powers of government must be separated so that each can check the others if they attempt to abuse their powers. "constant experience shows us that every man invested with power is apt to abuse it ... it is necessary from the very nature of things that power should be a check to power" (Spirit of Laws, 11.4). Montesquieu argued that the legislative power alone should have the power to tax, since it could then deprive the executive of funding if the latter attempts to impose its will arbitrarily. Likewise, the executive power should have the right to veto acts of the legislature, and the legislature should be composed of two houses, each of which could prevent acts of the other from becoming law. The judiciary should be independent of both the legislature and the executive, and should restrict itself to applying the laws to particular cases in a fixed and consistent manner, so that "the judicial power, so terrible to mankind, ... becomes, as it were, invisible," and people "fear the office, but not the magistrate" (Spirit of Laws 11.6). Liberty also required that the laws restrict only threats to public order and security, to protect us from harm while leaving us free to do as many other things as possible. Laws should not concern offenses against God, since God does not require their protection; or prohibit what they do not need to prohibit; or prohibit inadvertent or involuntary actions. Laws should not be vague, and should make it as easy as possible for an innocent person to prove his or her innocence. Montesquieu's philosophy that "government should be set up so that no man need be afraid of another" prompted the creators of the Constitution of the United States to divide the U.S. government into three separate branches. 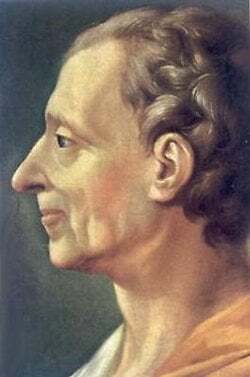 Montesquieu's emphasis on the connection between liberty and the details of criminal law inspired such later legal reformers as Cesare Beccaria. English translations of his books remain in print to this day. Montesquieu held a number of views that might today be judged controversial. While he endorsed the idea that a woman could run a government, he held that she could not be effective as the head of a family. He firmly accepted the role of a hereditary aristocracy and the value of primogeniture. His views have also been abused by modern revisionists; for instance, even though Montesquieu was an ardent opponent of slavery, he has been quoted out of context in attempts to show he supported it. One of his more exotic ideas, outlined in The Spirit of the Laws and hinted at in Persian Letters, is the climate theory, which holds that climate should substantially influence the nature of man and his society. He even asserted that certain climates are superior to others, the temperate climate of France being the best of possible climates. His view was that people living in hot countries were "too hot-tempered," while those in northern countries are "icy" or "stiff" (this view is possibly influenced by similar statements in Germania by Tacitus, one of Montesquieu's favorite authors). Person, James Jr. (ed.). “Montesquieu” in Literature Criticism from 1400 to 1800. Gale Publishing, 1988, vol. 7, pp. 350-352. Schackleton, R. Montesquieu: A Critical Biography. Oxford: Oxford University Press, 1961. History of "Charles de Secondat, baron de Montesquieu"
This page was last modified on 7 February 2017, at 16:27.